← Why is it hard to apologize? In the popular hype of MMA fighting, crowds cheering and roaring over the cage fights in an octagon echo the days of the gladiatorial fights in the sand arenas. The craze of seeing two people battle it out has not waned over the centuries. But what are the combatants fighting for? Beyond the brutality and violence, what is the ultimate triumph the fighters are aiming for? The trophy? The money? Fame? Personal accomplishment? I think what men fight for in the octagon is a metaphor of what we fight for in society. Why we fight says a lot about who we are. What do we fight for? 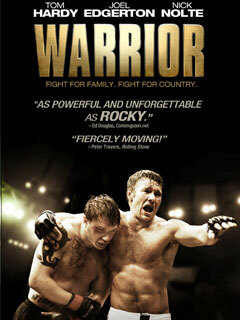 One of the films I enjoyed most last year was “Warrior,” a film that didn’t get a whole lot of attention but had a deep, moving story with incredible acting. It depicts a crucial dynamic of relationships in our society that stems from the condition of our souls. Why do we fight? If we can uncover the answer to this question, it illuminates much of why relationships are the way they are and what our souls are really searching for. I think the film illustrated the important factor that what people are fighting for is not always apparent. Sometimes the fighters don’t even realize what they’re really fighting for. But they fight. And we fight. Here comes the slight bit of spoiler, just to warn you in case you want to stop reading here. The story showed that what we are often fighting for is forgiveness. In all our hard bouts with people, self and society, forgiveness is the unseen prize that we’re trying to get to and often times don’t realize that is what we’re actually fighting for. In the surprising and revealing twist of the film, we find that the end of the fight is about achieving reconciliation that can only come by forgiveness and letting go of the anger. But forgiveness rarely ever comes easy for anyone. And that’s why we have to fight to forgive. The deeper the hurt and anger, the tougher the fight. The external fights we face in life represents the internal fights in our souls. We’re fighting to be free from our anger, hate and grudges. We’re fighting our way to forgiveness that manifests in reconciliation. The true and genuine Warrior then is the one who gets to a place where he or she no longer needs to keep fighting. When forgiveness is achieved, the fight is done. The Warrior has won. It’s nice to finally see a blog where I am not mentioned…I mean…me…MMA….hahahaha. Phew! I’m loving these blogs.